Casino games are full of judgment calls with what plays you should make sometimes. Should a blackjack player hit hard 16? Yes, if the dealer’s face up card is 7 or higher, but not if it’s 6 or lower. Should a Three Card Poker player match the ante with a play bet? Yes, if the hand is Queen-6-4 or better, but not with lesser cards. But there are absolutes, too. And many of those absolutes are absolutely not’s. Here are a few things you should NEVER do in a casino. Never bet four coins in video poker. On the first four coins, royal flushes pay 250 coins for each coin wagered. On the fifth coin, the jackpot jumps to 4,000 coins. The result: The house makes ALL its money on coins one through four, and gives something back to players on coin five. Let’s use 9-6 Jacks or better where a full house pays 9-for-1 and flushes 6-for-1 for an example. With expert play and making maximum bets of five coins per hand, the overall return on the game is 99.5 percent. But if we look at the five-coin wager as five one-coin bets, on the first coin we’re getting a 250-for-1 payoff on a royal flush, and our return is 98.4 percent. Same on the second coin, the third and the fourth. But on the fifth coin, our royal pays an additional 3,000-for-1 to bring us up to the 4,000-coin total bonanza. If you could isolate the payoffs on the fifth coin, you’d get back 106.2 percent. That’s how it is on all video poker games. You lose a little with a one coin bet, with double, triple and quadruple losses for 2, 3 and 4-coin wagers. The fifth coin gives part of that back to players. There is nothing wrong with a short-bankrolled player betting one or two coins just to have a little fun at low risk. But betting four coins gives the house its biggest profit. Never bet four. Never bet on any 7 in craps. All the one-roll propositions are tough on your bankroll, with fast action and high house edges. Any 7 is the worst, at 16.67 percent. Still, some players like to use any 7 to hedge their pass line bets, partially covering their losses when the shooter rolls a 7 with a point active. Let’s say you have a $5 bet on pass, and decide to hedge with $1 on any 7. If the shooter makes the point, you win the $5 pass bet and lose the $1 hedge for a profit of $4. If the shooter rolls a 7, you lose $5 on pass but win $4 with a 4-1 payoff on any 7, for a net loss of only a buck. Sound tempting? Well, what if the shooter rolls any other number? Say the point is 5, and the shooter rolls not a 5, not a 7 but a 6. Or an 8. Or 11. Or any other number. What happens? You lose your $1 hedge, and your $5 pass bet is still in action. Do you then bet a fresh dollar on any 7 and edge anew? You could lose that fresh dollar, and another, and another, and another before the pass bet is decided. Really, this goes for any of the one-roll propositions in craps. Betting the next roll will be 2, or that the next roll will be 12, carries a 13.89 percent. It’s 11.1 percent on 3, and the same on 11. Any craps, a wager that the next roll will be 2, 3 or 12, also has an 11.1 percent house edge. I wouldn’t make any of them. You could bet pass and come bets at 1.41 percent and don’t pass and don’t come at 1.36. You can back any of those with free odds with no house edge. You could place 6 or 8 with a house edge of 1.52 percent. Why stray from those to make a bet like any 7, where your average losses are $16.67 per $100 wagered? 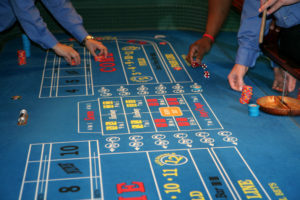 If a craps bet must be decided in a single roll, you don’t want to make it. Especially any 7. Never, never, never. If you have a pair of 5’s, you have a two-card 10. That is a great start to a hand. Split them, and you start two hands with 5 each — a pretty bad building block. So why do it? Most players get that. There are always a few, though, who think that if the dealer has a 5 or 6 up, that’s a “bust” card and it’s time to maximize wagers. The problem is that the dealer busts only 42 percent of the time with a 6 face up, and 43 percent with a 5 up. More than half the time, the dealer makes a 17 or better, and by splitting the pair, you’ve put yourself in a much worse position when the dealer doesn’t bust. Splitting 10s is also a play non-card counters should never make, not even when the dealer has a so-called “bust card” such as 6. When the dealer has a 6 up in a six-deck game in which the dealer hits soft 17, he busts only 43.9 percent of the time. That means when you split 10s and then a low card and stand on totals from 12 through 16, you lose 56.1 percent of your wagers. You do better with better draws, of course, but the bottom line is that with 20 vs. 6, your average profit is 67.7 cents per $1 wagered. If you split the 10s against a 6, your profit drops to 50 cents per $1 of your original wager. With the split and the extra bet, you’re taking on more risk and win less money. Don’t do it. Never make roulette’s five-number bet on 0, 00, 1, 2 and 3. There are dozens of options at double-zero roulette that give the house a 5.26 percent edge. There is one bet where you spot the house 7.89 percent instead. Guess which one? Yep, if you make the five-number bet, you’re spotting the house an edge half again as large as every other bet on a double-zero wheel. If you want to bet on those numbers, make a two-number split bet on 0 and 00 and a three-number street on 1, 2 and 3. Or bet all five numbers individually, or make some other combination of wagers on those numbers. Such methods get the house edge back to 5.26 percent. Just don’t lump them all together as a five-number bet. Never bet ties in baccarat. Bet on the banker hand, you face a house edge of 1.06 percent. Bet on the player hand, and it’s 1.24 percent. Ties? How does 14.4 percent grab you? Ties come up a little more than once per 11 hands, buy pay only 8-1. Baccarat players who love their scorecards, tracking banker wins, player wins and ties, sometimes like to jump on the tie bet when it hasn’t hit in number of hands, figuring it’s due. It isn’t. The time to bet ties in baccarat? The same as the time to bet four coins in video poker, or bet any 7 in craps, or split 5s in blackjack.